Israeli police employ series of illegal practices against Palestinian Arab citizen protesters, including preventive arrests and dispersal of legal demonstrations. 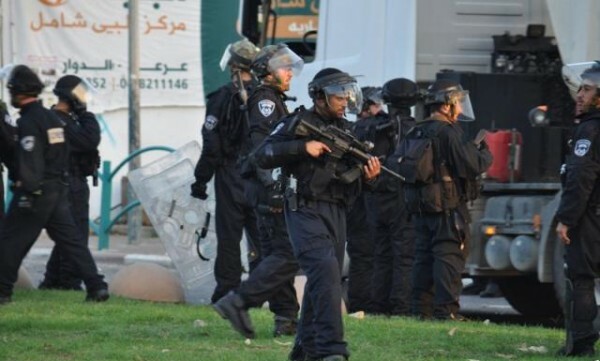 Adalah – The Legal Center for Arab Minority Rights in Israel is demanding that Israeli Attorney General Avichai Mandelblit issue new orders to the police to refrain from impinging upon the rights of Palestinian citizens of Israel to free political expression and protest. In a letter sent to the AG on 31 October 2016, Adalah Attorney Mohammad Bassam detailed a series of illegal practices and operational tactics employed by the police over the last year that constitute harm to Arab citizens' rights to freedom of expression and protest. Preventive arrests: Adalah emphasized in the letter that, "We have received multiple testimonies indicating that the police arrest citizens with the intention of preventing them from participating in or organizing protest actions or demonstrations. Such arrests constitute exploitation of the authority to investigate and detain and are, indeed, patently illegal when the sole purpose is to intimidate, deter, and dissuade citizens from partaking in future protest activities. In any case, these arrests were carried out without any justifiable cause or without any arrest warrant." Protest dispersal and false arrests: "Multiple testimonies we have received indicate that the police tend to disperse demonstrations and/or threaten to disperse them without any reason… For example, a protest in Akka (Acre) on 14 October 2015: Some 50 participants carried signs and protested government policies in East Jerusalem. Though this demonstration did not require a permit in order for it to take place, the police nevertheless dispersed the protest and arrested 22 of the 50 participants." Arrests of parents of youth who exercise their right to free expression: "In an additional – and invalid – means of deterring youth from exercising their right to free expression, police make use of judicial warrants to arrest the parents of such youth on a number of grounds. The police usually charge suspicion of incitement to violence or terror. In practice, some of the parents are never even interrogated by police. For example, the father of the female minor R.S. and the father of the female minor A.T. were told upon their arrival at the Nazareth police station that they were not actually suspects at all but rather that the police were looking for their children who had participated in a protest in October 2015." Release from detention conditional on limited free speech and movement: Attorney Bassam noted further in the letter that, "In multiple cases the release of protesters from police detention was conditioned upon signing a form agreeing to limits upon their freedom of speech and movement for an improper purpose, through the use of disproportionate means. For example, some individuals released from police detention were ordered to remain dozens of kilometers from their own homes and others were released to house arrest. These limits were disproportionate to the circumstances…"
Violations of regulations relating to youth and minors in police detention: "Police methodically violate provisions of the Youth Law. The police repeatedly violate its obligation under the Youth Law that stipulates a parent and lawyer are permitted to be present during the interrogation of a minor." In addition, statistics indicate unequal enforcement between Arab and Israeli Jewish citizens when it comes to the scope of arrests: between 2011 and 2015, for example, 89 percent of arrests for "participating in a riot," 62 percent of arrests for "participating in a forbidden gathering," and 98 percent of arrests for "gathering or organizing an unauthorized march" were of Arab citizens of the state. In its letter to the AG, Adalah stressed that "the practices described above – back by testimony from a slew of Arab citizens – paint a most troublesome picture regarding the systematic pattern of police operations when it comes to Arab citizens who seek to exercise their right to free political expression. The police approach – treating protest events organized by Arab citizens as events which inherently threaten state and public security – is an approach that stands in direct opposition to the very essence of the right to free expression, as well as to the police's obligation to refrain from limiting this right except in cases where there is an immediate probability of real and serious danger posed to public security and peace."